Revit Fix: Curtain Wall and Curtain Systems. Curtain Wall and Curtain Systems. The answer is, they are generally very similar, and each has its advantages and disadvantages in different circumstances. Both can contain panels, curtain grids, and mullions. Generally Curtain Systems are used for more complex non vertical shapes and are created using faces or model lines. My general recommendation is, if you are trying to create a gridded element that is 90 degrees to the Horizontal use a Curtain Wall, which is a sub-category of the Wall System Family. Some benefits of Curtain Walls. Curtain wall behave like basic walls. They are line based; you can trim them in plan, flip them between inside face and outside face, right click on their ends and drag their location, profile the shape in elevation, attach the top of bottom to floors and roofs and even convert them to other types of basic or stacked walls in your library. Panels with-in curtain walls have the extra advantage that they can create a curtain wall with-in themselves, as wall as apply a basic wall type as a panel. Curtain walls can be created using “Wall by Face” and still edited in plan using the drag end. A curtain wall with basic wall panels and windows inserted. Curtain Systems are their own system family and can be created only in the following ways. By converting a basic roof to a curtain system. When a curtain system in created by a particular method, it can only be edit using that same method (i.e. by face by changing the shape of the face). Tip; never delete the mass or lines you have created the curtain system from, as you will be unable edit the curtain system. Curtain Systems can not be profiled, can not be flipped between inside and outside, they do not contain blue dot drag ends, and can not be attached to roofs or floors. Curtain wall panels can not be changed to basic wall or curtain walls. Curtain Systems can however be off the vertical axis, dome or room glazed element. 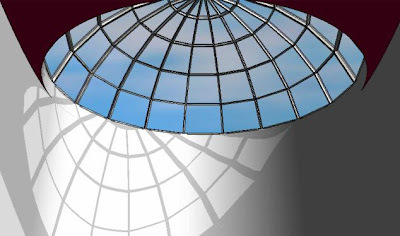 A curtain system roof dome. Because Curtain Walls are easier to edit, if you can use them, do so. The Cygnus Panel System is a patented, cost effective, prefabricated curtain wall system utilizing lightweight panels faced with ceramic tile or dimensional stone. Another possibility: use Model by Face to create a wall based on a mass face and make it Curtain Wall type. This gives you the added control of a curtain wall while still allowing it to be based on a mass face.